Catherine’s childhood in Africa instilled a lifelong sense of adventure. Born in North East England at 5 weeks she was the youngest passenger to fly on East African Airways back home to Uganda. Before she was 5 she had already travelled extensively through East Africa. In 1977, her family moved to Botswana, living in the Capital Gaborone, then a dusty little town on the edge of the Kalahari Desert. At that time, Botswana was surrounded by racist regimes and was an oasis of stability in a very volatile area. The capital was the base for many embassies and was home to large multicultural community. Catherine’s school, Maru-A –Pula, was founded on principles of education for all and known for its anti-apartheid stance, with many of the staff refugees from South Africa. She has powerful memories of assemblies to honour those killed in the Sharpeville and Soweto massacres and recalls frequently being marched onto the school playing fields as the school was prone to bomb threats. Many weekends were spent at the museum helping her mum, then Curator, hang exhibitions and being surrounded by this precious art work has proved to be huge influence on her current work. She is particularly interested in the events taking place in Southern Africa when she was growing up and the resistance against apartheid. Arriving in England to study A levels at Keswick boarding school Catherine developed a deep love of the mountains and discovered the Lakeland poets. Since she left boarding school she has often returned to the area to go climbing. Much of her work is influenced by her love of the mountains as well as her love of the North. During her recovery from severe depression the mountains, the struggle to survive in them and rawness took on a greater level of importance to her .It was during one of these trips to Keswick Catherine suddenly started painting and drawing which despite her childhood she had never done before. As this developed to a deeper level she realised art could not just be about capturing the feel and mood of the mountains, but also be the vehicle of remembering her childhood in Africa – the colours, textures evoking strong emotions. Self-taught Catherine’s work is multi-faceted working with a variety of media on canvas, paper, wood and glass. Working with oil paints, acrylic, house paint, enamel , she adopts unconventional techniques that include using sheets of Perspex, knives, brushes, construction caulk, sanding machines. She describes her approach herself as “having no rules and disrespecting the canvas”. She creates thick impasto and adds any item to hand including plastic, sand, string, leaves, textiles all superimposed on her canvases with slashes and scars to create dense deep powerful imagery with a moving vulnerability. Her work outlines a number of recurring themes and she strongly believes work must have integrity and meaning to truly communicate with the audience; otherwise it is just an object. Her work details a willingness to confront political and social messages and the power of art in highlighting issues, mental health awareness and the healing power of nature ,along with her longstanding love of Africa. A curator working with Catherine described her work “as each having a piece of your soul left in them”. 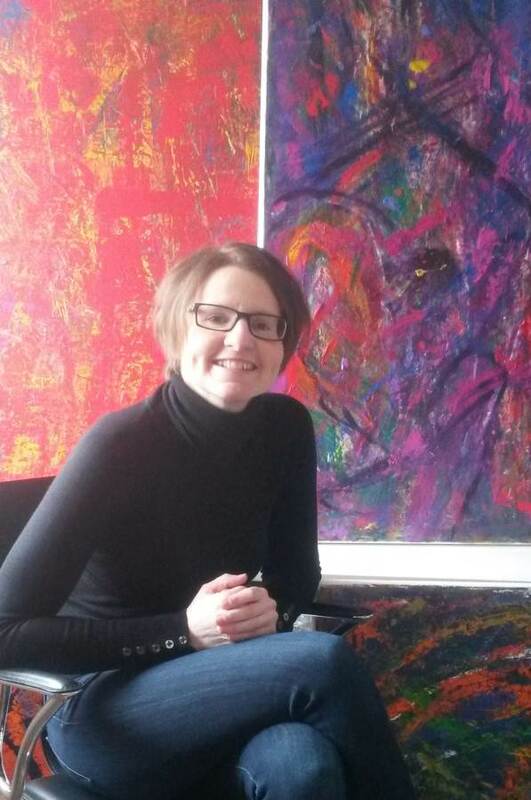 Catherine is currently studying for her Masters in Creative Practice at the prestigious Leeds Arts University.